Album covers and titles are often symbolic of the content within. 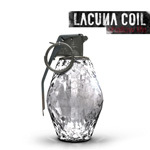 Listening to the new Lacuna Coil disc 'Shallow Life' is like having the glass grenade on the cover go off in your presence and wound you with its flying shards. Lacuna Coil has finally gone commercial. 'Shallow Life' not only applies to the lyrical content, but to whole musical approach. The album was recorded in LA with Don Gilmore (Linkin Park, Avril Lavigne, Good Charlotte) at the helm. The gloss and pretense of Hollywood is clearly evident: most songs clock in under three minutes and, though still delivering some hard rock with some metal thrown in, the songs sound more like mainstream popular rock. There's nothing new in their arrangements. Frankly, the music on 'Shallow Life' is so average, so typical of current mainstream hard rock, any current artist could have done it. Where once Lacuna Coil were standard bearers in their field, on 'Shallow Life' they have become merely pawns in the hands of the American music monster. In other words, 'Shallow Life' perfectly describes the current musical state of Lacuna Coil. I didn't want to use the phrase 'sold out,' but that certainly what 'Shallow Life' sounds like to me. Only because I usually do it in a review, I will at least give you what I believe are the highlights. The two best songs on the album are the first single 'Spellbound' where you first hear a decent guitar solo, and 'Unchained' where Lacuna Coil recovers from the sewer of mainstream rock to deliver some fine melodic heavy metal. For the pure commercial pop stuff, the two best cuts are 'I Won't Tell You' and 'I Like It' if only because of their memorable melodies and catchy choruses. Otherwise, you can pass over nearly 75 percent of 'Shallow Life' as tedious and mediocre mainstream dribble. Frankly, the music on 'Shallow Life' is so average, so typical of current mainstream hard rock, anyone could have done it. Where once Lacuna Coil were standard bearers in their field, on 'Shallow Life' they have become merely pawns in the hands of the American music monster. Lacuna Coil has finally gone commercial. Heaven help us all!